Did you know there are well over 100,000 islands on the earth? Many are unnamed and/or uninhabited. And until the first and second World Wars when troops scattered the globe, many were unheard of. Are you familiar with Corfu? I was not. 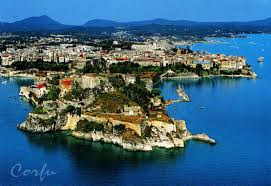 A popular tourist destination, Corfu is an island in the northwestern most part of Greece. 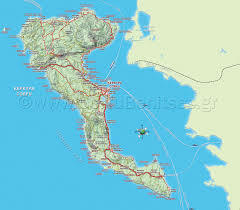 The second largest Ionian island, it is approximately 237 square miles in diameter (slightly larger than Guam). Shaped somewhat like a sickle, Corfu has multiple mountain ranges. Its coastline boasts high-end resorts and hotels. In the late 1920s, Italian Prime Minister Benito Mussolin announced it would be in the best interest of other countries to support Italy's need for expansion. When he received no rebuff Italy moved into a period of aggressive imperalism. A few years later, Italy began the Second Italo-Ethiopian war (the first being in 1895) in an effort to further expand the empire. By September 1938, the Italian army invaded Albania and within three days had occupied most of the country. As a result, relations between Italy and Greece quickly deteriorated. Greece petitioned Britain for help, but was turned away when England indicated it did not want to be drawn into a Greek-Balkan war. Tensions between the Greeks and Italians escalated during the summer of 1940 with war being declared in October. By the spring of 1942, the Italians succeeded in overtaking Coru and quickly set up camp. However, with the fall of Italian Fascism the occupiers were taken prisoner by the Nazis who took control in 1943. For the second time in two years, residents found themselves occupied by a foreign power. A year later, the Allied troops liberated the islands as the Germans were evacuating Greece. A seemingly small, out-of-the-way island, yet an integral part of World War II history.